Facebook is a lot of fun...until you realize that much of the information posted there could be found by someone you might not want to see it. Like your boss, or potential boss. Your mother, or your potential mother-in-law. Ever wonder how your Facebook page might make you look to someone else? NetworkClean can show you: This free service scans and monitors your Facebook account, alerting you to any problems lurking there. NetworkClean's dashboard gives you an overall look at the state of your Facebook account. Currently in beta, NetworkClean is a tool that's designed to be run on your own Facebook account to manage your own Facebook reputation, similar to Reputation.com, which offers both free and paid versions of a comprehensive Internet monitoring service. NetworkClean offers many of the same features offered by tools that are designed to monitor the Facebook use of younger children, such as MinorMonitor and SocialShield, and could conceivably be used in the same way, but isn't expressly designed for this purpose. To use NetworkClean, you need to grant it permission to access your Facebook account. And the first thing it does is post a big ol' advertisement on your Timeline, letting your friends know about NetworkClean. Then, when it begins scanning your Facebook account, NetworkClean displays a pop-up suggesting you like its page on Facebook. I was able to dismiss this pop-up on the first computer I used for testing, but then when I tried NetworkClean on a second computer, I had to like the NetworkClean page in order to continue using the service for free. While I understand the need for advertising, I could do without these intrusions. Luckily, NetworkClean offers useful features that make up for the ads. Once your Facebook account is scanned (which takes several minutes, but not an inordinate amount of time), the service presents you with an overview via its neatly organized dashboard. 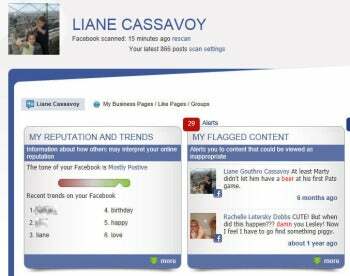 It told me that the overall tone of my Facebook is mostly positive, which seems fairly accurate. So, too, does the face that recent trends on my account include "love" and "liane"--but I'm not sure how useful that information is. NetworkClean also flags potentially offensive content. Like all of the other Facebook monitoring services and apps I've tested, NetworkClean flagged several false positives and other questionable terms. Among them: a nickname for Richard, the words "damn" and "pooper" (as part of the term "party pooper"), and the term "hacking," which was used to describe a cough. The terms can be found in status updates, private messages, wall posts, or photo captions and comments, but NetworkClean doesn't identify exactly where they were found. So, it can be hard to know immediately whether you need to fix something or not. The service does include a direct link to fix the item in question on Facebook, though, so taking action is easy. Also useful is NetworkClean's ability to identify potential problems with your Facebook privacy settings. It alerted me to the fact that my security question (which is used to protect your account) had not been answered. Again, NetworkClean offers an easy and direct link to Facebook that allowed me to fix this quickly. NetworkClean could be used to keep tabs on your child's Facebook account, but it's better suited for personal use. It doesn't offer alerts about risky behaviors that parents would want to see, the way MinorMonitor and SocialShield do. If you're interested in seeing how your own Facebook account might look to prying eyes, this service will tell you everything you need to know--and maybe more.